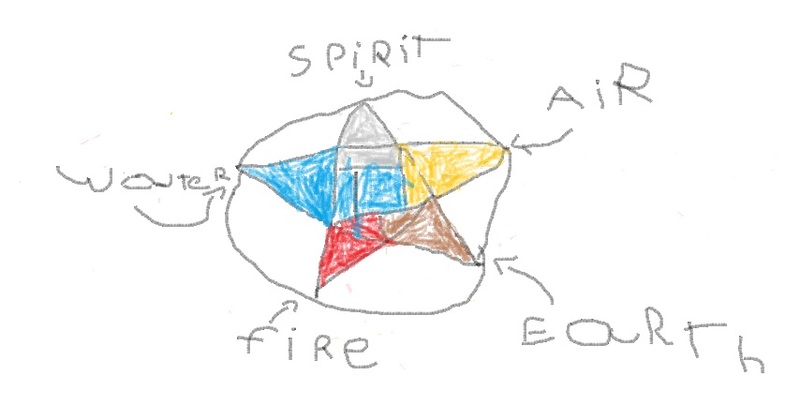 My son talks about his dreams, and honors his ancestors, he can read the Runes, and he believes in magic. He believes that magic is the concept that anyone is capable of anything they wish to accomplish. Magic is taking responsibility to make that wish a reality. My son has chosen to be Pagan. He is seven years old. It is written into the parenting agreement of my divorce decree that my son is to be raised Pagan. Religion serves many purposes. Religious beliefs give people moral and ethical frameworks in order to navigate the world. Religion helps connect humanity by directing focus onto something larger than our individual selves; a something in which each individual is a part. The Family court structure in the United States recognizes these important functions of religion. During divorce proceedings, it is strongly encouraged that the religion in which the child is to receive his moral and ethical training be clearly named. This is to address any misunderstanding that might arise in the future, such as if one parent happens to re-marry and convert to another religion; or it potentially avoids later conflict if the parents have different religions. At the time of my divorce, I was (and I still am) a deeply religious and practicing Pagan, my son’s father was a non-practicing Christian. Everyone, even the courts, agreed that Pagan religious training made much more sense than no religious training. In 2012 my son’s father joined a prominent Christian church and he began taking our son to church as often as his visitation schedule allowed. I assured my son that if he would prefer to be Christian that was perfectly alright with me. Tynan asked my thoughts on original sin and Eve’s pursuit of knowledge and many other things. I gave him my own opinions and stressed that they were only opinions, based on my limited experience. I told him that I did not have all the answers and that he should also ask his father. My son has gone to his father’s church and he has listened to the sermons. There are many beautiful things about the Christian religion and it has much to teach in the area of basic human ethics and morality. However, my son expressed his frustration with Christianity, because “they don’t believe anything else is true,” as my son said. My son and I actually have different Gods. I honor the Goddesses Diana and Persephone from the Roman pantheon. My son is moved by the Nordic Goddess Freya and the God Odin. Our differences are accepted and honored. It is a shame that my son perceives that his ideas are dismissed in his father’s Christian world. “Pagan church” as my son calls it is full of songs and interesting stories, there are games and lots of food. Everyone is encouraged to participate but if you just want to listen (like my son) that is honored just as highly. My son said that at his father’s church “they just want to tell me what to do all the time,” and he doesn’t like it. “And they don’t believe in magic, Mom,” said my son. Burning offerings is a common way to show gratitude to the Gods, incidentally. I never specifically told my son that, but he listens, as all children do, especially it would seem, when we think that they aren’t. My son is not as political when it comes to his religion. However, he has a school project coming up that includes a section on religion. 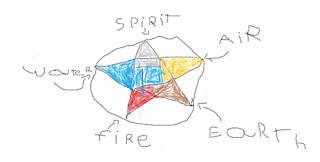 He made the decision all on his own to include a beautiful drawing of pentacle that he made. My seven year old son is a proud Pagan. I wish we could all be so. Happy Pagan Coming Out Day.